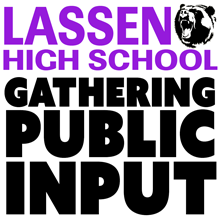 Lassen High School’s Board of Trustees will be meeting with local groups and holding a public forum next week to gather community input as part of district’s search for its next Superintendent. The district will hold several sessions with various groups within our community on January 23rd to receive input about the desired qualities and characteristics of the next Superintendent. According to the school this input will be a valuable contribution to the recruitment and selection process. 1. What personal and professional qualities for an incoming superintendent will be a match for the Lassen Union High School District? 2. What are the strengths of the District, and what are the challenges you see for the District in the coming years? In addition to the various sessions, the District will be hosting an Open Forum, which is open to all the public. No appointment is necessary to participate. This Open Forum is an opportunity for the public provide input and to hear more about the search process. The Open Forum will be held in the District Office Boardroom, located at 1000 Main St. at 6:00p.m. on January 23rd.